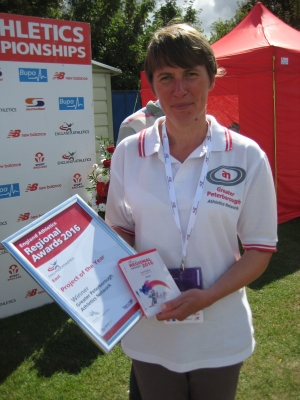 The Greater Peterborough Athletics Network was today awarded the "Best Project" award for the England Athletics Eastern Region. 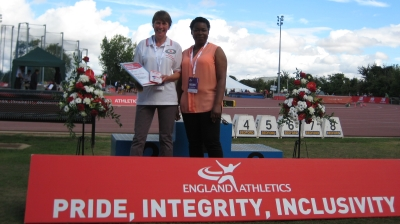 The presentation was carried out at the England Athletics Under 17 & Under 15 Championships held at Bedford International Stadium and was received by GPAN and Werrington Joggers coach Roz Hamlyn on behalf of all GPAN member clubs. GPAN is an active network made up of nine affiliated athletics and road running clubs, and is supported by two main partners; Advance Performance and Vivacity. (i) GPAN/TDA Satellite Club, providing athletics to new participants. (ii) GPAN/TDA Girls Running Group to support under-represented groups. (iii) GPAN Try the Track programme providing fortnightly track sessions to all road runners within the network ran by qualified coaches. An average 60-70 runners from across GPAN clubs take part each session. (iv) GPAN Green Wheel Relay in which 36 teams took part this year over a 50mile course offering an income generator for the network helping them to sustain and invest in other participation and community projects. (i) Coach led ‘Get Fit 4 the Eastern’ track training sessions in lead up to the Perkins Great Eastern Run. (ii) Leader led early morning and lunchtime running sessions in partnership with Peterborough City Council targeting employees at local workplaces. (iii) Inclusive Try the Track sessions which have previously offered a British Sign Language interpreter, working in partnership with a local deaf charity. (iii) Road Traffic Management and First Aid Courses for Officials. 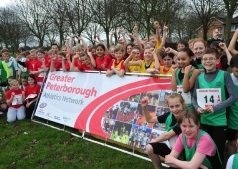 The Greater Peterborough Athletics Network is a group of nine local athletics clubs and can be found at their website here www.gpan.org.uk. British athletics star Abi Oyepitan inspired young people in Peterborough at a Sportivate beginners running project at the Thomas Deacon Academy recently, one of the key initiatives to create a sporting legacy from the 2012 Olympic and Paralympic Games. Find out more about Abi's visit to the Thomas Deacon Academy from England Athletics here. And this from the Peterborough Evening Telegraph. Forty GPAN club members in twenty teams of two runners took to the track for the 2014 Xmas Parlouf Relay organised by Mike Chapman. 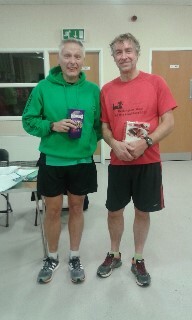 The winning team being Mike Blackledge (Eye) and Mark Turner (Werrington Joggers). A great event enjoyed by all with the added attraction of mince pies and shortbread to refuel after the race. 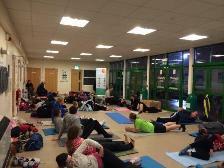 Our best turn out ever for a workshop, that was the attraction of the first GPAN 'Pilates for Runners' session led by Helen Preston. The exercises from the night can be found on the Resources page. Hopefully we can get Helen back for some more sessions, watch this space! At the December 'Try the Track' session the athletes took part in a GPAN Parlouf relay. 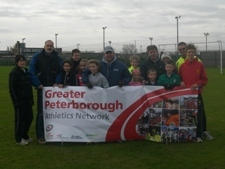 The Greater Peterborough Athletics Network (GPAN) has had a busy month for coach development, hosting two workshops at the Peterborough Athletics Arena. The first session was delivered by Ros Shuttleworth from RS Physio. The session focused on the importance of biomechanical movement in relation to improving athlete performances and helping to develop mechanically robust athletes, able to withstand the demands of training and competition. 16 coaches from The Greater Peterborough Athletics Network attended this session, as well as a couple of athletes. The session combined theory and practical to provide coaches with an opportunity to practically assess the movement patterns of athletes and make a basic assessment. Ros provided coaches with some tangible ideas and exercises to use within training sessions as well as some 'self-help' exercises for athletes to incorporate away from training and in to their daily schedule. The second GPAN coach development session was delivered by Helen Preston BSc(Hons) MCSP and three of her colleagues on Wednesday 6th November 2013. 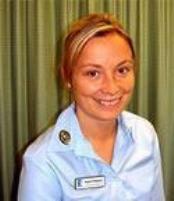 Helen is a Clinical Director and Chartered Physiotherapist at Prestons Health based in Peterborough and Oundle. 29 coaches and athletes from across GPAN attended this coach development workshop. The session aimed to (i) explore the multidimensional risk factors for developing pain in runners, (ii) identify the normal movement patterns required for efficient running and; (iii) facilitate an opportunity for coaches and runners to experience some key movement patterns in a supportive learning environment. 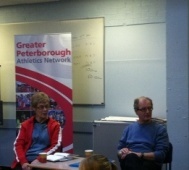 Tim Cook, Chair of the Greater Peterborough Athletics Network, commented "we are extremely grateful to Roz and Helen for giving up their time to come and speak to GPAN members. Both talks were interesting and stimulating and gave us food for thought. Feedback I've received has been particularly appreciative of the practical elements of the talks and the opportunity to discuss them with Helen and Roz." The next GPAN coach and athlete development event will be held on Wednesday 29th January at the Embankment track, starting at 7pm. 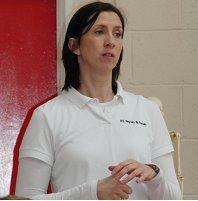 The session will cover Pilates for Runners and will be delivered by Helen Preston. If you would like more information about this workshop or other GPAN initiatives, please see the events page. The workshop is free to all coaches and athletes who are members of GPAN clubs. 16 Teams took part in the second Green Wheel Relay staged on Sunday 22nd September. The race which consists of 7 stages over a distance of 50 miles takes place around the Peterborough Green Wheel. The race this year was organised on behalf og GPAN. 17 athletes from GPAN clubs got some expert tuition and tips from England Athletics Endurance Coach Mentors and City of Norwich Athletic Club (CONAC) coaches Tim and Pauline Ash. The Endurance Training session which took part at Stanground College saw the group complete laps of the field at different paces and time periods. The practical session was followed by a Q&A session which explored the benefits of Cross Country as a good way to improve performance on both the road and track. GPAN will be holding some Cross Country training sessions from Landy Green starting on 12th December. Details may be found on the 'Events' page. Thirty athletes attended the first GPAN track session held this week. The sessions follow on from the successful 'Get Fit 4' training for the Great Eastern. The next track session is on Wednesday 21st November. Full details on the 'Events' page. 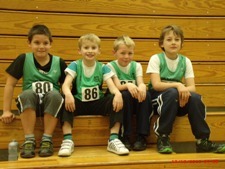 37 young GPAN athletes took part in the 1st of two Sportshall competitions at Bushfields Sports Centre. One of the athletes wrote about the experience. "We all had a really good time and are looking forward to the next event which is on Saturday 24th November and we would really like some more junior members to come along and have as much fun as we did"
The next Sportshall is on Saturday 24th November. Full details on the 'Events' page. GPAN were pleased to be able to provide support for the local Junior Cross Country Relay to ensure the event can continue for the next four years. The annual event event sees teams of four athletes competing against each other promoting healthy competition amongst the local Primary Schools. Ed Baker from Performance Hertfordshire delivered a presentation to GPAN club reps aimed at helping athletes get the best from training by ensuring the correct diet. Slides from the presentation are available here: You are what you eat. Further resources about Nutrition can be found by clicking here: Eat and Drink like a champion. Coaches and athletes from GPAN clubs listened intently to former UKA Head Coach Nick Anderson explain how to plan and prepare for Marathon and ½ Marathon distances. No matter how experienced everyone learnt something from the evening. To find out more about Nick and some tips on Marathon preparation go to www.runningwithus.com. Nick is back again later in the year with some tips on 5k and 10k training. Please see your club GPAN representative for details. Fifteen GPAN club members attended an England Athletics / GPAN organised Traffic Management course held in Eye. The course which leads to an NVQ level 2 Qualification is designed to equip those attending with the skills to identify risks when planning an event and to implement traffic management measures. To-day was the final Saturday morning XC coaching session at Stanground. I've attached the updated weekly summary, but in short 31 different children attended and completed a total of 95 hours training, the breakdown by club was PAC 8, NVH 3, WJ 4, Yaxley 3, Eye 2 and unknown 11. The figures represent a significant increase in numbers attending in previous years. Some of the children, along with parents and coaches, who took part in the 2011 XC coaching sessions at Stanground College organised by GPAN. Twenty four GPAN coaches attended a workshop with David Hemery held at the Peterborough Athletics Centre. The session which featured an insprirational presentation by David with interaction from the coaches was an excellent way to launch the coach development aspect of GPAN’s activities. Lowestoft based former winner of the Chigago Marathon Paul Evans supported by GPAN coaches spent the day in Peterborough visiting a number of local schools to encourage potential young athletes to get involved. During the evening Paul led two training sessions, one for younger atheletes and another which saw the seniors from many of the local clubs put through their paces.